Cosmonaut André Kuipers is ready to go for a 6 month mission to the International Space Station ISS. 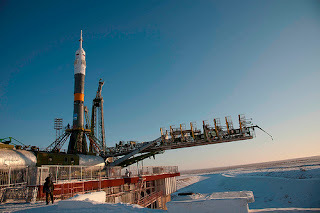 His Soyuz rocket has been erected on the Launchpad in Bajkonour, Kazahkstan. Tomorrow, december 21, at 14:17 (NL time), he will lift-off.